This article first appeared on Other Words on October 30, 2013. On October 8, Tucson police officers pulled over a driver because the light above his license plate wasn’t working. 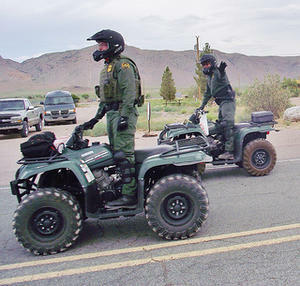 When he didn’t present a license, a typical scenario unfolded: Under Arizona’s infamous SB 1070 law, cops become de facto immigration enforcement agents. Simply put, the state’s “papers, please” measure obligates police to rely on “reasonable suspicion” to determine if someone possesses the proper documents to be in the United States. But police officers don’t actually make immigration-related arrests. Instead, they call the U.S. Border Patrol. The October 8 incident marked just one of 50,000 such referrals that happen yearly in Tucson. The same Arizona immigration bill that former Department of Homeland Security (DHS) head Janet Napolitano called “misguided,” is enabled by her agency’s collaboration with Arizona’s local police forces. And it’s empowered by the government’s systematic expulsion of 400,000 people from our country each year. Efforts to overhaul the nation’s border security and immigration policies are revving up again in Washington. That means a renewed push for enhanced border policing, such as the $46 billion in the reform bill the Senate passed in June. That kind of spending would bring the Border Patrol’s creeping militarized mission further into the interior of the United States. The Border Patrol isn’t just any agency. The Tucson police were calling in the largest U.S. federal law enforcement agency—by far—with a post 9/11 priority mission to stop terrorists and weapons of mass destruction from entering the United States. Yet its main tasks remain routine immigration enforcement and drug interdiction, creating an uneasy and often blurred mixture of missions. Border Patrol is part of Customs and Border Protection, a DHS agency created in 2003. Its 60,000 agents make our border forces more than double the size of Ecuador’s army. The army metaphor isn’t far-fetched: Customs and Border Protection has its own air and marine forces, a special operations branch, and a separate tactical unit. Its rapid-response teams have 500 agents ready to deploy anywhere within 48 hours. Its Predator B drones and Blackhawk helicopters are patrolling the desert southwest as if they were in an Afghanistan war zone. It has armored personnel carriers and uses forward operating bases like those in U.S. wars to secure positions in remote areas. Roughly 700 miles of walls have scarred the landscape of the Mexican borderlands, backed by increasingly sophisticated surveillance towers, cameras, and more than 12,000 motion sensors. Since 9/11, the government has funneled $100 billion into these border weapon and surveillance systems. For what? The United States has friendly relationships with Canada and Mexico. One salesperson who was trying to cash in on this border security gold rush (he was peddling his company’s mobile surveillance camera) told me “we are bringing the battlefield to the border,” now that U.S. intervention in Afghanistan and Iraq is winding down abroad. The Senate’s bill called for adding 19,000 Border Patrol agents to an agency that has already doubled its ranks since 2006. There’s no way that this influx of agents and technology, with its enhanced national security mission, would be limited to the border, where the Homeland Security presence is becoming an occupying army. If this measure were to become law, the federal government would bring the battlefield to our neighborhoods. Consider what happened in Tucson on that warm October night. Despite the government shutdown, a Border Patrol vehicle arrived on the scene, more than 70 miles away from the U.S.-Mexico border. Border agents put Arthur Robles and Agustin Reyes into a small cage in the back of the truck. One hundred people showed up and formed a human wall around the Border Patrol vehicle to stop it from taking those two fathers of small children away. Their activism was met with violence as Border Patrol agents crashed through the crowd, making more arrests, and police shot rubber bullets and pepper spray. Officials try to justify such actions by using words such as “criminal aliens” and “narcoterrorists” that float around the media like ghouls in Halloween. However, as the unprecedented numbers of deportations indicate, this militarized border is advancing into the interior of the country at a rapid rate. If you are—or just appear—foreign, watch out. Todd Miller has researched and written about U.S.-Mexican border issues for more than 10 years. He has worked on both sides of the border for BorderLinks in Tucson, Arizona, and Witness for Peace in Oaxaca, Mexico. He now writes on border and immigration issues for NACLA Report on the Americas and its blog Border Wars, among other places.